…and the disciples were first called Christians in Antioch. I mentioned in my previous blog post, Zetterholm, Ancient Antioch, and “Honey, I Want a Divorce”, that I wanted to discuss the implications of the final chapter in Magnus Zetterholm’s book The Formation of Christianity in Antioch on a number of different religious communities. Obviously, there are implications for the modern Church, but also I see how ancient and modern Judaism is significantly impacted, as are the Messianic Jewish and Hebrew Roots movements. I’ll take each one in turn. Based on what Zetterholm concluded regarding the forced separation of Gentiles and Jews in the Jesus-believing communities which resulted in Gentiles forming their (our) own brand new religion called “Christianity,” we can see that we weren’t kicked out of Jesus-believing Judaism. We rebelled like a petulant teenager and walked out the door. Certainly if Saint Ignatius of Antioch can make a statement such as, “[i]t is monstrous to talk of Jesus Christ and to practise Judaism” (Magn. 10:3 quoted by Zetterholm on pg 203), we aren’t talking about a “no-fault divorce.” The “Church Fathers” went out of their way to “demonize” Judaism and separate any “valid” worship of Jesus Christ from anything related at all to the Jews. We noted above that Ignatius in Phld. 6:2 connected Judaism with the activities of “the prince of this world,” and that he in Magn. 8:1 probably used popular prejudice against the Jews in describing Judaism as being based on myths and fables. It is well known that, in the decades after the death of Ignatius, Christian literature abounds in developing anti-Semitic themes. It is likely, as Schoedel states, that the identification of Christ as the word from silence refers to the supposed inability of the Jews to understand their own religious tradition: the appearance of Christ from silence brings the divine hidden purpose to light. The radical “Christianization” of the prophets is one indication of how profound this inability is, and how extensive the hostility is between Judaism and Christianity. I know I’ve quoted these passages from Zetterholm’s book previously, but they’re important for context. As the history of the Church attests, these attitudes weren’t isolated to the first few centuries of the Common Era, they’ve echoed down the corridors of time from Ignatius of Antioch to the modern Christian Church with predictable results on Jews and Judaism. True, we no longer torture Jewish people in order to force them to convert or exile them from our nations, but we aren’t always “safe,” either. Sarah (not her real name) is a young Jewish woman, an academic, raised in Orthodox Jewish life, who came to believe in Yeshua in a remarkable manner some years ago. Having been greatly sheltered in her upbringing, and knowing nothing about either Protestants or Messianic Jews, she wanted to serve Yeshua in an academic setting. She therefore joined the Dominicans, a teaching order of the Roman Catholic Church. She reasoned that they would allow her to teach freely in her field. In this she was right: as an excellent teacher, she was allowed to freely teach. She also assumed, on the basis of her limited knowledge of the early Yeshua movement, that she would be allowed to live as a Jew while she served Yeshua amongst the Dominicans. In this, she was wrong. Her superiors were at first amused at her adherence to Jewish life, then annoyed, and then intolerant. She was thrown out for her unacceptable adherence to Jewish life. This is a true story, and really, nothing new. It should not have surprised Sarah, but it did. And it shouldn’t surprise the rest of us either. I know Evangelicals are going to point out that Dominicans (Roman Catholics) were responsible for rejecting Sarah’s Jewish observance, but imagine how a Jewish believer would be received in a Protestant church if she were to continue significant Jewish observance such as kashut and Shabbat. You might not think it would be an issue, but consider. Should “Sarah” show up at your church for a communal meal, how would you feel if she passed up the ham and took a salad instead? What if she kept an even more strict form of kosher and wouldn’t eat unless the meal had been prepared in a kosher kitchen (which church kitchens and Christian homes would not possess)? How would you feel if “Sarah” visited your home for a Bible study on Friday afternoon but after sunset, chose to walk back to her home and even refused a ride from you because it was Shabbat? 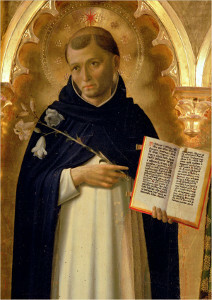 You might be amused for a while but I suspect, like the Dominicans in the tale above, amusement would give way to annoyance and finally, intolerance. We haven’t come so far from the writings and attributes of Ignatius after all. The Church has much to repent of. Note: For those who feel I’m being overly hard on the Christian Church, especially the modern community of Christ, please continue to read. I’ll address this matter further at the end of today’s blog post. Dovetailing on my previous statement, the modern Church still gives religious and even secular Jews reason to question their (our) motivation for any form of approach to them. My experience tells me that most often, Jews are politely cautious when a Christian enters Jewish religious or social space or conversely, invites them into our space. We speak of “interfaith relationships” or “interfaith events” but there really is no such thing as a “Judeo-Christian” shared experience. The minute those two concepts entered the world, they existed in opposition to one another. Why should Jews trust Christians? Why shouldn’t organizations such as Jews for Judaism believe there is a (perceived) threat represented by the Christian Church, including organizations like Jews for Jesus? I’m not saying Jews for Jesus is a bad organization and that the Church is necessarily an active threat against Jewish faith and practice, but the best predictor of future behavior is past behavior. If you want to know how the Church is going to act toward Jews in the future, look at Church history. I’m saying that Jewish people have a reason to be dubious about Christianity and that all began nearly two-thousand years ago. 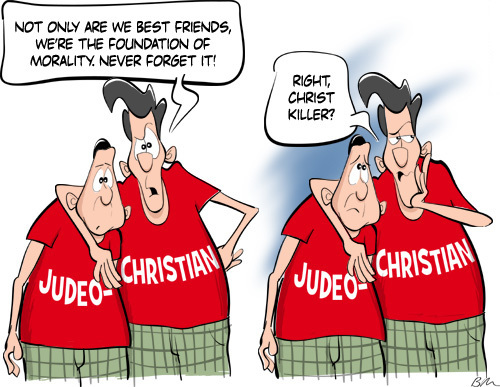 Sadly, Jews and Christians really do have a shared history but it’s not a positive one. Note: This doesn’t mean that Judaism in all its expressions is perfect or hasn’t made it’s mistakes, but rarely is Judaism in a position as an extreme minority in our world to “throw its weight around,” so to speak. Through the vast majority of the history of the Jewish people, they’ve been much too busy just trying to survive. This is an “umbrella category” designed to cover just about any Gentile Christian organization, small group, or fellowship that specifically identifies itself as seeking the “Hebrew roots” of the Christian faith and who adopt an altered theology, doctrine, and practice based on some sort of “Hebraic” perspective on the Bible. It’s probably unfair of me to treat Hebrew Roots as a single entity given what I’ve just said, since it is comprised of so many divergent groups and attitudes, but then, that’s pretty much true of Christianity and Judaism as well. One of the (more or less) commonalities within Hebrew Roots is the belief that Hebrew/Jewish practices are also incumbent upon any Gentile who is a believer in Jesus. This usually includes some sort of practice based on modern synagogue worship including praying with a siddur, donning of a tallit gadol (for men, usually), wearing a kippah (again, usually for men), and other acts that superficially create the impression that these Hebrew Roots practitioners may be Jewish. We saw in Zetterholm’s book that Gentiles participating in the ancient Jewish synagogue of “the Way,” were sometimes mistaken as Jews due to their association with Jews and likely many of their practices and lifestyle behaviors, so it’s possible to extrapolate that situation into modern Hebrew Roots. But there’s a problem. In ancient times, Gentiles adopted some Jewish practices and behaviors because they were operating within a Jewish religious and social context and were being mentored by Jewish teachers and synagogue leaders. Hebrew Roots operates in total separation from Jewish community and often is denigrating of much of Rabbinic Judaism. Hebrew Roots tends to believe they practice a form of “Biblical Judaism” as opposed to “Rabbinic Judaism,” and as a result, they reject many of the practices and conceptualizations that are associated with modern or historic Judaism. In this, they somewhat mirror the original Church Fathers who separated their own practice from Jewish authority and community, creating a self-sustaining entity that by necessity, operated in opposition to the normative Judaisms of its day. Like many Evangelicals, many Hebrew Roots groups have sort of “love/hate” relationship with modern Judaism, mainly because of Rabbinic Judaism’s insistence that they have the right to make internally binding rulings and the ability to govern their own communities. Note: Hebrew Roots has a lot of different expressions, some of which are truly serving God, helping others, and teaching the good news of Messiah. I worshipped with one such group for many years and my companions were Godly and humble people. But Hebrew Roots is kind of like the “wild west,” where anything can happen and where anyone with a kippah and a theological ax to grind can dub themselves a “Messianic Rabbi” and draw a following. Be cautious. Like the other groups I’ve discussed above, there is no single, monolithic organization called “Messianic Judaism”. All Messianic Jewish groups have certain things in common, but the details of their theology, doctrine, and practice are variable. One thing all Messianic Jewish groups (at least in the U.S.) have in common is the majority of their members are not Jewish. The ancient Antiochian Synagogue of the Way, while “owned and operated” by a Jewish leadership and Jewish teachers, was also inclusive of Gentiles, though there’s no way to determine the ratio of Jews to Gentiles in their midst. Messianic Judaism, for this reason, faces some or even most of the same challenges as did the apostle Paul’s mixed Jewish/Gentile Jesus-believing communities, principally the issue of integration. As my previous blog posts on Antioch, Zetterholm, and Nanos attest, the issue of integration was of paramount importance and at the same time, hotly contested (see Galatians 2 for example). That the Gentile Jesus-believers were included in the New Covenant blessings and part of the soteriological system of Judaism was not in question, especially to Paul, but the nature of their role and participation in a Jewish community and religious stream was still problematic. The Acts 15 ruling aside, we don’t really know how day-to-day life in the Messianic synagogue among Jewish and Gentile co-participants was negotiated. That’s a question Messianic Judaism is trying to answer today as well. We see from Zetterholm that, given the right social and political pressures, this could all blow up in their (our) faces (again). It’s one of the arguments in support of a concept Rabbi Mark Kinzer introduced called Bilateral Ecclesiology. Zetterholm seems to believe that James the Just, the brother of Messiah and leader of the Council of Apostles and Elders in Jerusalem supported an ancient version of Bilateral Ecclesiology, the establishment and maintenance of separate communities of Jews and Gentiles in Messiah. Ironically, that’s exactly what happened historically, but with disastrous results. But that’s unfair and untrue. That’s not exactly what happened. Kinzer’s Bilateral Ecclesiology (and presumably James’) assumes that the separate Jewish and Gentile communities exist in a complementary fashion, sharing a common theology and doctrine (but not identical practice), maintaining a cordial but distant relationship with one another, while supporting the right of each group to maintain their own identity within an exclusive space. History has shown that the relationship between ancient Christianity and Messianic Judaism was anything but complementary and cordial, although distance was created, maintained, and expanded, usually due to animosity. Zetterholm believes Paul opposed James’ view on separate Jewish and Gentile space in Messiah and that he believed in a shared community of Jewish and Gentile Jesus-believers. That said, shared space and social community doesn’t equal shared identity, role, and responsibility and that’s the rub. Did Paul have a clear vision of exactly how Jews and Gentiles were to exist in community with each other in all the details? The Didache might be one possible answer to that question since one suggested origin for this teaching is with the apostles or those close to the apostles. The Didache may have started out as an oral teaching that accompanied the spread of the “Jerusalem letter” (Acts 15) among the diaspora Gentiles in community with Jesus-believing Jews. Note: As I’ve mentioned above, Messianic Judaism includes a variety of different approaches to how a Jew may be a disciple of the Jewish Messiah and continue to be an observant Jew. In the days of Peter and Paul, this was a given. No one wondered how this was possible, it was simply understood. The problem was how to integrate Gentiles. That’s the problem today as well, and responses run the gamut from Jews-only Messianic groups to full social inclusion of Jews and Gentiles in the synagogue. I think of Messianic Judaism as a work in progress. Also, keep in mind that many Hebrew Roots groups call themselves “Messianic Judaism,” however once in, the distinction is obvious. So here we are. The Church, if possessing any belief that it somehow has replaced the Jewish people and national Israel in the covenant promises, continues to have much to answer (to God) for. The Church has much to answer for if it continues to oppose Jews who have faith in Messiah and continue to observe the mitzvot of the Torah of Moses. Thankfully, an increasing number of churches are accepting Jesus-believing Jews who are Torah observant Jews, but we have a long way to go. Hebrew Roots, while a noble effort to attempt to recapture what Jesus-believing Gentiles lost with the ascension of Gentile Christianity and the (ultimate) collapse of Jewish Jesus-faith, often chooses to throw the baby out with the bath water, so to speak. In trying to recapture and apprehend ancient Hebraic practices and implement them in the modern era, they many times utilize modern Rabbinic worship practices while rejecting historic and modern Rabbinic Jewish rulings and even fail to acknowledge the Jewish community’s right to self-govern and self-define. Gentile Christians seeking the Hebrew Roots of the faith might find a better model in those who have become known as Messianic Gentiles, but there are still many challenges involved when traveling that path, as I can personally attest. Messianic Judaism continues to struggle forward toward not only its own identity, but the identity of the Gentiles in its midst and as the Apostolic record and Zetterholm’s research indicates, Messianic Judaism is characterized, in part, by the communal inclusion of the Gentiles. Perhaps they would have eventually developed a “bilateralness” in relationship with each other, but that doesn’t seem to have been what Paul was trying to create. I offer no solutions to any of this, but if you think you have any, I invite you to comment. We may never know what would have happened if Paul’s vision of the mixed Jewish/Gentile ekklesia had been realized, but given our current situation, we’re obligated to take the next step forward, whatever that might be. I know I’ve laid the lion share of the responsibility for the Jewish/Gentile split within the body of Jesus-believers at the feet of the then new religion called “Christianity.” Further, I continue to assign responsibility to the modern Church for its long history of abuses against Jewish people and Judaism. Am I being unfair? I suppose you could say so. 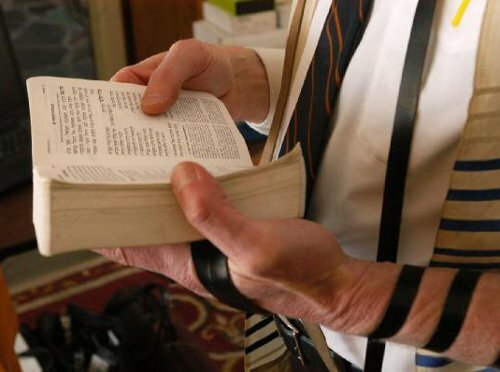 It never occurs to MacArthur, or to any of the Evangelical church Pastors or their lay staff, or to the congregations of all those churches, that the reason they don’t see God being critical of Jewish Jesus-believers performing the Torah mitzvot wasn’t “tolerance.” It was because God expected Jewish Torah observance as a matter of covenant obedience. It wasn’t an aberration or some quaint set of customs that Jewish people had a tough time letting go of, it was their very lifeblood, the linkage between God and the Jewish people, more so than ever with the realization that the Messiah was the inauguration of the living fulfillment of all of God’s promises to Israel. Even in the most Israel-friendly, Jewish people loving churches, this attitude still remains, in spite of a great deal of scholarly evidence to the contrary. This is what the Church yet has to repent of and so far, they don’t even see the problem. If “Sarah” were to show up in my Bible class next Sunday and give her interpretation of Acts 21:20, how would she be received? I don’t know how far to push in class over the troubling interpretation of this single bit of scripture (and it’s wider implications), but how can I remain silent in the face of everything I’ve just written? Addendum: And then there are rather disturbing current trends in Christianity, such as the one presented at the Rosh Pina Project about who is expected to speak at Bristol Baptist College. Previous PostSermon Review of the Holy Epistle to the Hebrews: The Evangelical GospelNext PostDid Paul Know Jesus was the Second Person in the Trinity? Incorporating “Sarah” into this article very effectively reveals the continued problem James, good job! I recently saw r. Dauermann and heard him tell a fuller version of “Sarah’s” story, which is quite remarkable. The upside is that God is doing some amazing things in the arena of Jewish /Christian understandings, paradigms, and restoration. However, as r. Dauermann pointed out, the “lamp” can also be removed if we don’t fully comprehend and enact our God-given roles and missions. It’s vitally important for the Church to wake up and, as you say, there is much to repent for. I think fear of being wrong prevents Christians from truly examining the failures the Church has racked up against the Jews, and replacement theology immunizes us from seriously considering our crimes. But once we grasp that God has never and will never renege on his promises to the Jewish people – who HE defines in scripture as the ethnic descendants of Jacob (and not some spiritualized replacement)–and instead realize that he will keep every promise he ever made to them, we are introduced to a far more beautiful, merciful, and trustworthy God than we (Christians) have ever imagined. In other words, we too can be secure in the fact that our sincere repentance will be met with great mercy. However, let’s pretend that an Evangelical Pastor of a local church really was convinced of the major errors involved in Protestant theology and doctrine. What would he do about it? Announce it from the pulpit? Introduce it to the board of directors (elders, deacons)? The Pastor would lose his job and be out the door faster than a bullet. Evangelicals like Scot McKnight can write (sort of) about the “truncated gospel” taught by the church in books like The King Jesus Gospel based partially on his referencing other “big names” in the Evangelical world like N.T. Wright and Dallas Willard, and partly on this established reputation as a Pastor, teacher, and author. But the average Pastor in a local community church would have a much more difficult time of it, especially if he started suggesting that his church make major changes to it’s teaching philosophy and content. 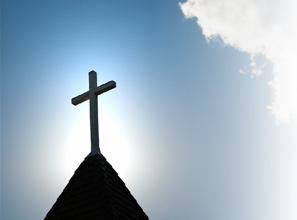 In the current world, Evangelical Christianity sees itself at the top of the heap, so to speak, theologically. They’ve got Jesus and they’ve got salvation and everyone else doesn’t. Their main job is to share the good news and to change as many other people in the world into Evangelicals and then, when they die, they all go to heaven. Everyone else goes to hell. Accepting the reality I’ve been presenting here means that Evangelicals have to step off of the hill and grant that position to national Israel based on God’s covenants with the Jewish people and His promises made in the Abrahamic, Sinai, and New Covenants. In other words, Christians would have to accept a “one down” position to Israel, especially in terms of a soteriological future. This is the same issue faced by Gentiles in the first century Jewish Messianic community. After the Temple was destroyed, Jerusalem fell, and after the two failed Jewish revolts, the Jews were scattered, including the Jewish authority base over the Messianic community. Not only did Gentiles vastly outnumber their Jewish counterparts, it was massively unpopular in the Roman empire to be Jewish or to have anything to do with Judaism. This was the prime opportunity for the Gentiles to take over and remake the Messianic faith into their own image as a Torah-free Christianity. The position of superiority won’t be surrendered easily and I suspect King Messiah, when he returns and fully establishes his reign, will have to wrest that sort of arrogance from the Gentile Church forcibly. Agreed, and that’s what I meant by replacement theology immunization, we (typically) never get to the point of seriously questioning the role of “God’s chosen people” – as defined in scripture – from their seat in the pew. It’s supposedly all about “us.” The fear comes when they are exposed to a “Sarah”, or someone who’s articulating our problematic past regarding the Jews, such as you and I and many others do. That’s why, I suspect, Christian antiSemitism isn’t taught in seminary, and therefore isn’t taught from the pulpit. That’s why we don’t distance ourselves from Church Fathers who had horrid teachings on the Jews, and that’s why most Christians have no clue about these things and think they are on solid ground. The ones who do know the past also understand the implication, as you mentioned, as a one down position; that requires great humility that they (Jewish people) are the head and not the tail. Those who are humble enough to do so must find another path, or squirm. I believe the only reason I kept looking, wondering, searching, and rocking the theological boat was due to the fact that I was (am) intimately involved with Jews. To be fair, the Pastor of the church I attend *does* make a point of teaching how we should respect the Jewish people and reject any anti-Semitic attitudes when he preaches. On the other hand, he doesn’t see defining the Torah observance of Jewish believers as we see in Acts and the Epistles as a “transitionary period” away from the Law to toward grace. The dire implications of this theology are completely invisible, even when I point them out. It’s not just devotion to the Church Fathers, either. The men of the Reformation are given quite a bit of honor without any acknowledgment of their failings, especially in relation to Jewish people and Judaism (see Martin Luther and The Jews and Their Lies). The Reformation didn’t “reform” as much as people want to believe it did. It certainly didn’t reform the relationship between Gentile Christianity and its original Jewish construction. The distinctions God created in humanity are male and female, and Jew and Gentile. Unfortunately, these beautiful distinctions have been viewed, more often than not, as a competition rather than for the obvious purpose of mutual blessing, and bringing life. James, check out this fellow. A Jewish rabbi engaged in interfaith dialog with Christians. North Texas! That’s wild country in the Protestant world! @Ruth: Unfortunately, human beings tend to look at distinctions as competitors or opponents, even tongue-in-cheek (“Battle of the Sexes” and that sort of thing). We have to rise above to see distinctions as complementary, that is, we need each other. @Steve: That’s a little unusual but not unheard of. Rabbi Shmuley Boteach goes out of his way to create bridges between Jews and Gentiles, and Mark Nanos (a Reform Jew) seems motivated in his New Testament scholarship to heal the interfaith rift between Jews and Christians. I’m sure I’ll write about it, Alfredo. Well Alfredo, I did go to church, listen to the sermon, and go to Sunday school class where I carefully chose my comments…and the response was nice, dull “thud.” I don’t think anyone got what I was trying to say. I did get a sort of “revelation” on a related topic during the sermon, so now I have fuel for two blog posts.